Odisha Chief Minister Naveen Patnaik launched 'Nirman Kusum Yojana' on October 06, 2018. Under this scheme, financial assistance will be provided to provide technical education to the children of laborers engaged in construction work. Under this scheme, the dream of building workers to get their children high education will be completed. 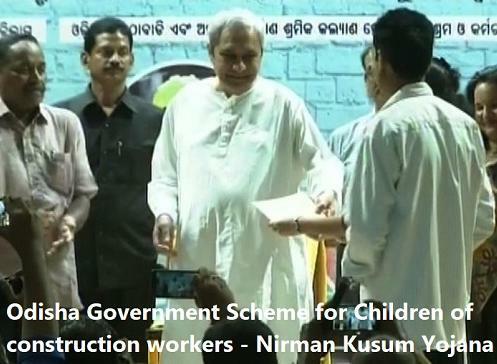 In a program, the Chief Minister gave financial support to more than 500 students of construction workers doing ITI and diploma in government institutions on behalf of the Construction Workers Welfare Board. Under this scheme, the annual financial assistance of Rs 23,600 to the Government ITI student and the annual financial assistance of Rs 26,300 will be provided to the diploma student. The scheme will benefit 1878 students. The amount of Rs.1.09 crores will be spent on this project. The government has decided to increase this stimulus by 20 % for girls. Financial support for girls will be given from 6th class to post-graduation. Apart from this, the government has increased the number of one lakh rupees given to the death of the worker to Rs 2 lakh. Similarly, in the event of an accident, the financial benefit has been increased from 2 lakh to 4 lakh rupees. In addition, the Chief Minister flagged off the senior citizen pilgrimage train from the railway station in Balasore through video conferencing. This train will go to Agra, Fatehpur Sikri, and Mathura during a six-day visit to 1,000 pilgrims. The Chief Minister said that the government would bear 100 percent of the cost of such children studying in Government ITI and Engineering Diploma Institutions.